Her name might ring no bell, but Ezim Anne Giwa-Amu is the widow of the first Attorney General of the defunct Midwestern Region, Sir Steven Idowu Ohiole Giwa-Amu. Her grandfather too, a Scottish, was the Agent General (Head) of the defunct Royal Niger Company, a firm instrumental to the formation of Colonial Nigeria. Those ties are however not what makes Giwa-Amu, who turned 75 in March, an interesting personality. 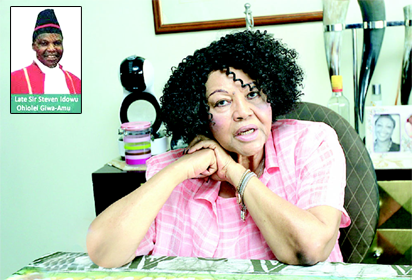 A die-hard follower of the late Archbishop Bishop Benson Idahosa until she relocated to the US where she was, years later, ordained a reverend by Archbishop Margaret Idahosa, she reveals, in this interview, among other things, how God entrusted in her hands the spiritual welfare of Nigeria; and how she has since then executed several prophetic projects on behalf of the country. We say some people are born with silver spoon; I happen to be one of such. But my mother passed on when I was 13 and I had my siblings to take care of. That’s why, today, they don’t look at me as a sister but as their mother. I think the experiences of my mother’s death pushed me into early marriage. At 19, I was already married to my late husband, Steven Idowu Ohiole Giwa-Amu, and was pregnant. I remember how I cried frequently over the phone to my grandmother each time I was overwhelmed by my inexperience in caring for a new-born. We were in Benin-City back then; where I also grew up. I remember she would say, ‘You know I am old and cannot do anything or come. But whenever you have problems, call me on the phone’. I remember the time my first child fell inside the bath from my hands. I had six children in all and we grew together in age (laughs). This is the tenth year since my husband’s demise. That marriage was quite early; were you pregnant or was it that you both were dating? It wasn’t a mistake. Like I said, my mother’s death threw a lot of responsibilities on me. My grandmother was old and I had to be a mother to my siblings. So, I just had to get married. As for dating, no; I didn’t have the privilege of dating like you people do now. My husband just came and said he wanted to marry me. What was it like to be married to the first Attorney General of the Midwestern Region? I want to tell you something I admired so much about him; he took his job as his job. My husband never allowed his official car to come home to take anybody anywhere. He had his car, I had my own car and that was it. I didn’t ever have to go to his office; what will I be looking for there? His official closing time was 4pm and, thereafter, he would come straight home. So, I was a normal wife like any other housewife. Nobody ever addressed me as Wife of the Attorney General and I did not expect it anyway. So, his official duties were his official duty and they ended at the office. Feed us with more memories of him. He was such a loving husband and father to our six children. After school, he would insist all the children sleep for at least one hour. He was a teacher and role model to his children and many others who grew up in our house because my house was like a boarding house. When my husband resigned as the Attorney General, he didn’t come home with anything apart from the file he carried daily to his office. In fact, he declared his assets; he had 31 pounds in his account. My children went to public schools like every other child. My father-in-law, Michael Giwa-Amu, was the first Inspector General of Nigeria; we called him so being the first Nigerian to rise from recruit to Inspector of Police and that was the highest at that time. So you can see the nature of family my husband came from; not the sort of police officer to that would ask “Oga, wetin you come give us?” So, my husband and his siblings lived like their father; holding integrity in high esteem. Let us talk about transparency and accountability in public service today; legislators for example go home with millions monthly and are not accountable to anyone. How can we begin to hold our leaders accountable? I will use the United States of America as an example. Since the day about 17 children and two teachers were shot in a school, the children have continued to protest. The protest is increasing by the day and everybody now is advocating for gun control because the children are standing up and protesting heavily. What (President) Trump brought up as remedy was to arm teachers but the children would have none of that. Since the beginning of the year, there have been 19 shootings and the children are now saying they have had enough. Nigerians too should rise up. I am not saying fight or kill; just open your mouths and speak up—demonstrate. Somebody has to speak up. The day we say we have had enough, then we’ve had enough. The slavery in this country is enough. While still in Nigeria and working for the Lord— ever before leaving for the US where I resided for many years—the Lord told me he needed somebody to trust; somebody to commit the spiritual aspect of this nation Nigeria to. He asked me, “Would you be my eyes there?” and I accepted. So, I had a lot of pastors that He made me call together; we started praying for this country and still maintain that even up till today. We’ve had a lot of prophetic projects across the country and wherever or whosoever He sends us to, we go. God has manifested Himself through that ministry in a big way even though we do not have a name. My associate pastors however call the group ‘New Dawn’. New Dawn has taken us to quite a number of places; as well as many other African countries. I was actually a Deaconess in the Church of God Mission in Benin-City before relocating to Lagos and thereafter to the United States. I bagged a degree from the Oral Roberts University College of Theology and Ministry in 1972 and have since continued to work for God. I was ordained a reverend in the US by Archbishop Margaret Idahosa. How do you measure the impact of the assignment given you by God, vis-à-vis the prevailing unrest in the country? For how long should we wait for that young man; is it when Nigeria disintegrates? Nigeria will not disintegrate. When one of the Presidents, a Christian, was there, the Lord told us (my New Dawn prayer team) to carry out a prophetic action; which we did with the support of the President as instructed by God. The Lord asked us to collect the sand (earth) of each state and bring them together at our prayer point in Abuja, mix together. When we were done, He asked us, “Do you know where each of these sands came from?”, and we said “No”, and He said that was what He wanted to do with Nigeria. The Lord instructed that each time he (the then sitting President) got afraid about the country, he should stand on the sand and make a decree and He (God) will intervene. I keep reminding that former President to never forget the work of God committed into his hand. Even when he celebrated his birthday recently, I still reminded him of this task. I dare not do what God did not ask me to do; hence, I did everything concerning that prophetic assignment according to God’s direction. Herdsmen attack on communities is now a trend; do you see these people overrunning this country? Overrun? Do you not know or has it not occurred to you that the God who made the heavens and earth is in charge of this country? And He still lives. He is not dead. I tell you, nobody can overrun this country. I have that confidence because God said it; I’m not relying on what you journalists write but what the journalist of heaven said. The post ‘My husband denied us the use of his official cars for family needs’ appeared first on Vanguard News.